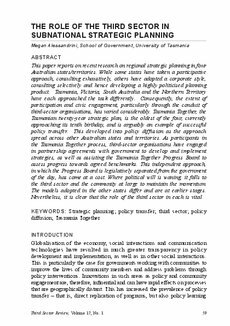 This paper reports on recent research on regional strategic planning in four Australian states/territories.While some states have taken a participative approach, consulting exhaustively, others have adopted a corporate style, consulting selectively and hence developing a highly politicised planning product. Tasmania, Victoria, South Australia and the Northern Territory have each approached the task differently. Consequently, the extent of participation and civic engagement, particularly through the conduit of third-sector organisations, has varied considerably. Tasmania Together, the Tasmanian twenty-year strategic plan, is the oldest of the four, currently approaching it's tenth birthday, and is arguably an example of successful policy transfer. This developed into policy diffusion as the approach spread across other Australian states and territories. As participants in the Tasmania Together process, third-sector organisations have engaged in partnership agreements with government to develop and implement strategies, as well as assisting the Tasmania Together Progress Board to assess progress towards agreed benchmarks. This independent approach, in which the Progress Board is legislatively seperated from the government of the day, has come at a cost. Where political will is waning, it falls to the third sector and the community at large to maintain the momentum. The models adopted in the other states differ and are at earlier stages. Nevertheless, it is clear that the role of the third sector in each is vital.